We’d love your help. Let us know what’s wrong with this preview of Sorcerer's Crime by Christopher Kellen. Desperate for warmth, Moncrief avails himself of the hospitality of a small village -- by claiming to be th After outwitting the Arbiter D'Arden Tal and barely escaping with his life, Edar Moncrief left his entire life behind and vanished into the mists. He had hoped to get lost and stay lost, but winter is coming on, and his power can only keep the cold at bay for so long. 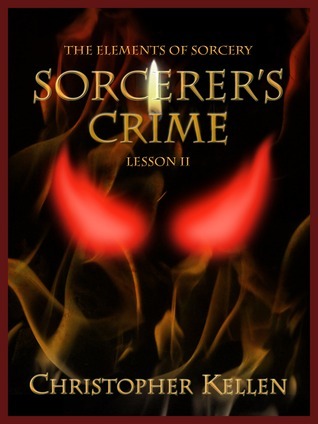 To ask other readers questions about Sorcerer's Crime, please sign up. I should point out that if you've made it this far, I'd advise you to pick up the Elements of Sorcery compendium as I have (which contains all the stories at a reasonable price) rather than purchasing them individually. After a brush with an Arbiter and things much worse in the opening lesson of the Elements of Sorcery, Edar Moncrief chances upon a village in dire need. It turns out that there's some sort of curse, and he feels compelled to do something about it, in spite of the fact that the vill I should point out that if you've made it this far, I'd advise you to pick up the Elements of Sorcery compendium as I have (which contains all the stories at a reasonable price) rather than purchasing them individually. It turns out that there's some sort of curse, and he feels compelled to do something about it, in spite of the fact that the villagers do seem the sort that like to kill sorcerers. So what's the best solution to this problem? Why, pretend to be an Arbiter of course! Our sorcerer discovers that he's soon over his head, and things ramp up to a satisfying conclusion with plenty of action. Kellen's style is much the same as his last story, and if it ain't broke, don't fix it. If you enjoyed Sorcerer's Code then chances are you'll enjoy this story just as much.